There are no Solar Eclipses for the UK this month, the next partial eclipse isn't unit 2021! 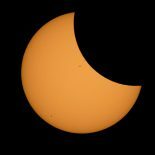 There is however a partial solar eclipse on the 13th of July but we won't be able to see it as it as at 01:00 in the morning. There are no Lunar Eclipses this month, the next one isn't until July 2019. Click on this to find out when and where! Would you like to create star trail images? Click on this to find out how!